Someone over on the WordPress forums asked for a way to display the category description when using Graphene‘s front page category option. This is actually easy to do using Graphene’s action hook widget areas. If you’re not familiar with this feature, you should first read my tutorial on Graphene’s action hook widget areas before attempting this. I’ve got to admit, at first I wondered why anyone would want to do this. But once I looked into it, I realized that a) if you do use Graphene’s front page category option, this is actually a really good idea, b) Graphene is such a flexible theme that it can easily accommodate something like this which isn’t a built-in theme option, and c) this is actually a good way to demonstrate how to combine Graphene’s action hook widget areas and built-in WordPress functions. So I went over to my test blog (which is really just a sandbox for computer stuff; I used to have it online but now run several in localhost on a WAMP server) to work out how to do it. I’m going to assume that you know how to create and edit a category, but if you need to know what that looks like, click on the image to the right to see that image full size in another window/tab. You’ll notice that you can select multiple categories. Remember that, because we’ll come back to that after a bit. There is a sticky post above that, and it’s going to show up no matter what category it’s in. That’s because a sticky post always shows up on the front page, regardless of this particular theme option. That’s a WordPress feature (not a Graphene bug), and the only way to avoid it is to not make that post sticky. After all, if you don’t want it on the front page, it shouldn’t be sticky anyway. After that, I needed to find a good widget area. Since this is going to appear on the front page, I decided to use one of Graphene’s action hook widget areas that shows up there anyway, such as under the slider. I went to Graphene’s Advanced Options feature, clicked on includes/theme-slider.phpand ticked the box next to graphene_after_slider . That creates a widget area just under the slider. If you’re not using the slider, then you will need to find a different widget area to implement this. Using Graphene’s action hook widget areas sometimes involve a bit of trial-and-error. In this case, I would recommend using graphene_before_content in header.php. If you sense the voice of experience here, you’re right. I used that same area in this tutorial, where I explain how to add some useful text widgets (or any kind of widget, really) to the top of your blog. Navigating over to the Widgets pane, there’s now a widget area labeled “Graphene After Slider.” On to the next step: actually adding our category description. To be honest, I could just drag a text widget over to it, enter whatever content I want for a category description, and call it a day. If you feel that all the stuff you’ve read here so far is too technical or too esoteric (or too geeky), you can go ahead and do that and no one can blame you for anything. But bear with me for a moment. Let’s try a different, slightly more complicated, and infinitely more interesting way to do this. Unfortunately, that code won’t do anything for us, because we need to replace that $category_id variable with the actual number of the category in question. *If you want to know more about this function, you can read about it in the WP Codex. 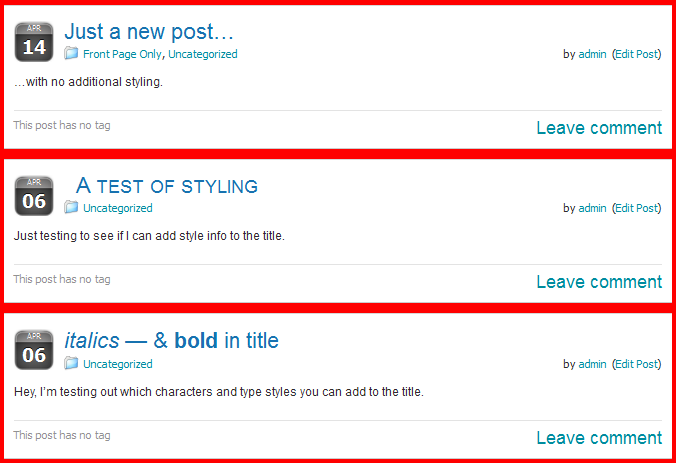 In either case, we can see that WordPress has added a class of category-20 to the <body> tag. Bingo! I mentioned earlier that you should remember that Graphene will allow you to display multiple categories on the front page. You can handled this a couple of different ways. 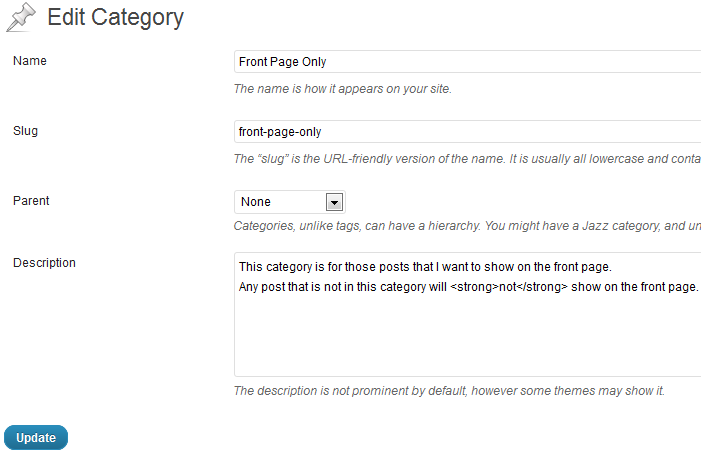 You could also add a second PHP widget, and add the code for the other category to the second widget. To figure out how to make them line up side by side, read this tutorial. As you can see, Graphene is an amazingly adaptable theme. It’s fairly easy to add a feature that no one has thought of before. I hope this is a clear explanation of how to do this. If you have questions, comments, or a better way to do this, please drop a comment. Thank you so much for this tutorial. If not for this, I would probably have asked the same question in graphene support forums. I have a question about this page… How did you get Table of Contents with the [hide] at the top? It’s a very handy little plugin, with lots of customisation options.